Japan has released the Housing Starts y/y, Consumer Confidence, Monetary Policy Statement, BOJ Policy Rate, BOJ Outlook Report, Prelim Industrial Production m/m and Unemployment Rate. The US will publish CB Consumer Confidence, Chicago PMI, S&P/CS Composite-20 HPI y/y, Personal Income m/m, Personal Spending m/m, Employment Cost Index q/q, and Core PCE Price Index m/m. The support rests at 110.850 with resistance at 111.910 which the weekly pivot point at 111.050 is located in between the lines. The EMA of 10 is moving with bullish bias in the descendant channel and it is above the EMA of 200 and below the EMA of 100. The RSI is moving above the 50 level, the Stochastic is showing upward momentum and the MACD line is above the signal line in the positive territory. The ADX is not showing any clear signals. 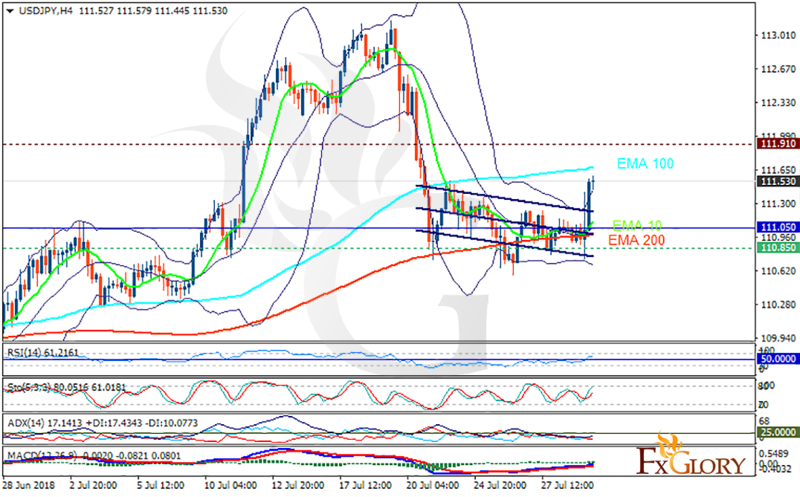 While 112 remains the resistance area, USDJPY will be fluctuating within the Bollinger bands.